Google ranks as the most-liked brand among Democrats, according to this year’s study, by YouGov Brand Index, of consumer brands and political affiliations. This is the second year in a row that the Mountain View, California-based Internet giant came in as the Democrats’ favorite brand. For Republican voters, Fox News Channel takes the top spot. Overall, Democrats prefer more technology brands, while Republicans favor a larger number of television brands, the study found. Independents favorite brands include a mixture of both. Amazon came in at No. 2 for Democrats, and Sony took the No. 4 slot on the “Blue brands” list. FOX and the History Channel followed Fox News for Republicans. The History Channel, The Discovery Channel and Google took the top three spots with Independents. Google did not make the list among Republican voters. Other Democrat-exclusive brands include Amazon, Sony, PBS and Levi’s. Republicans were the only group of the three to list Fox News Channel, FOX, Craftsman, Lowe’s and M&M’s in their top 10 choices. 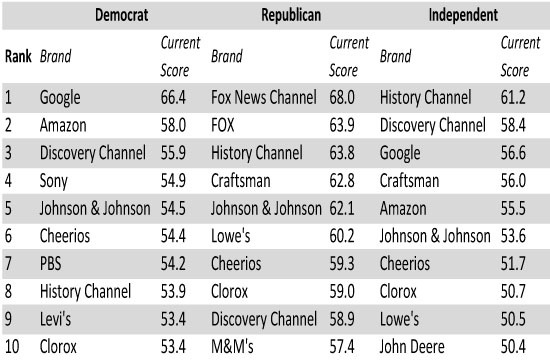 Brands that showed up on the most-liked list of all three political affiliations include The Discovery Channel, Johnson & Johnson, Cheerios, History Channel and Clorox.